The placement of the cargo in the trailer will have a tremendous impact on the distribution of weight across your axles. 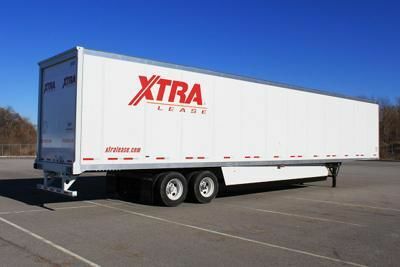 Properly loading the cargo will get your axle weights pretty close initially so that a minor adjustment may be all that's needed to get your axle weights legal. Improperly loading the cargo could place too much weight to the front or rear of the trailer, preventing you from being able to balance the weight across the axles properly. When loading cargo into the trailer, you want to first make sure that you have your trailer tandems within the legal length limits allowed from the kingpin to the trailer tandems for the states you'll be travelling in. You can look up these limits in your Rand McNally Motor Carrier's Atlas. You can slide the tandems as far forward as you would like, but you can only place them as far back as the kingpin to trailer tandem laws allow. Let's take a look at some factors involved in properly loading cargo. The center of gravity location of the cargo is the center point of the cargo's weight. In other words, if all of the cargo in your trailer was one solid block, the center of gravity would be the point that the entire block would balance upon like a teeter totter. You'll want to have the cargo loaded into the trailer so that the center of gravity is centered between your drive axles and your trailer tandems. If unsure of the exact location of the center of gravity of your cargo, you'd rather have the center of gravity of the load wind up a little closer to the front of the trailer than to the rear. You can slide the trailer tandems forward as far as you would like to compensate for too much weight on the nose of the trailer, but the kingpin to trailer tandem length limitations will prevent you from going too far back with your trailer tandems. You can also physically move some of the cargo toward the back of the trailer if necessary when you have too much weight to the nose. Here you can see the cargo is properly loaded with the center of gravity centered between the drive axles and trailer tandems. Here you can see the cargo is improperly loaded with the center of gravity too far to the rear of the trailer. Here you can see the cargo is improperly loaded with the center of gravity too far to the front of the trailer. Here you can see the cargo is loaded in the overhang portion of the trailer creating leverage on the trailer tandems. Everyone is familiar with the concept of using a lever. Using a lever on an object allows you to exert more force upon the object than the amount of force you're actually exerting against the lever itself. In other words, you might rig a lever that can lift a 250 pound boulder but requires only 50 pounds of force against the lever itself. When loading cargo into a 53 foot trailer, leverage can come into play. When hauling freight in a 53 foot trailer, you will always have some overhang behind the trailer tandems because the laws limiting the overall length from kingpin to trailer tandems won't allow you to put the trailer tandems all the way to the rear of a 53 foot trailer. The portion of the trailer behind the trailer tandems is the overhang portion of the trailer. In figure 4 above, you can see how the cargo is loaded into the overhang portion of the trailer. Because the trailer pivots up and down at the kingpin above the drive axles, the floor of the trailer acts as a lever pushing down against the trailer tandems when freight is loaded into the overhang portion of the trailer. 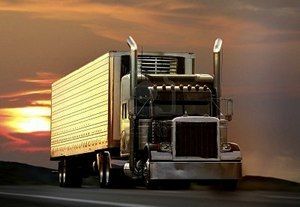 The further back you load the freight into the overhang portion of the trailer, the more leverage it creates. The net effect of this leverage is that you're putting more weight on the trailer tandems than the cargo itself weighs, and you will actually take a little bit of weight off the drive axles at the same time. This can be used to your advantage, or it can work against you, depending on your circumstances. We're going to spare you the formulas and mathematics of leverage, but I'll give you an example of what you're dealing with. If you load a 100 pound box 10 feet behind the center point of the trailer tandems, you will add about 120 pounds of weight to the trailer tandems, and take about 20 pounds of weight off of the drive axles at the same time. This is another reason that when you're estimating a load's center of gravity, you'd rather load the freight with the center of gravity a little closer to the nose than the rear. If there is room enough to do so, you can always move some of the cargo to the very back of the trailer to help balance the weights properly when sliding the tandems all the way forward won't do it. Ideally, where would you like the cargo's center of gravity located? Centered between your drive axles and your trailer tandems. You'll want to have the cargo loaded into the trailer so that the center of gravity is centered between your drive axles and your trailer tandems. If the center of gravity of the cargo is too far to the front or rear of the vehicle, it is entirely possible that you will not be able to get your axle weights legal without reloading the cargo itself. What is the cargo's center of gravity? The average height of the cargo above the trailer floor. The distance from the front of the trailer to the center point of the cargo. The center point of the cargo's weight. The overall length of the cargo after being loaded into the trailer. Sometimes you will load 22 pallets that all weigh the same. That makes it simple to determine the center of gravity. But often times you'll have a mixed product and you'll have to look over what's being put on the truck so you can get the weight of the cargo roughly centered between the drive axles and trailer tandems. What will be the ultimate limitation that prevents you from putting the trailer tandems as far to the rear of the trailer as possible? If you load cargo into the overhang portion of the trailer, what will be the result? You will put more weight on the trailer tandems than the cargo itself weighs, and you will actually take a little bit of weight off the drive axles at the same time. You will put less weight on the trailer tandems than the cargo itself weighs, and you will actually add a little bit of weight to the drive axles at the same time. Because the trailer pivots up and down at the kingpin above the drive axles, the floor of the trailer acts as a lever pushing down against the trailer tandems when freight is loaded into the overhang portion of the trailer. The further back you load the freight into the overhang portion of the trailer, the more leverage it creates. The net effect of this leverage is that you're putting more weight on the trailer tandems than the cargo itself weighs, and you will actually take a little bit of weight off the drive axles at the same time. If you are able to exert 200 pounds of force against an object but you are only exerting 50 pounds of force to do so, what method are you applying to make this happen? Using a lever on an object allows you to exert more force upon the object than the amount of force you're actually exerting against the lever itself. In other words, you might rig a lever that can lift a 250 pound boulder but requires only 50 pounds of force against the lever itself. Loading the cargo behind the center point of the trailer tandems exerts leverage against the trailer tandems. You will actually put more weight on the trailer tandems than the cargo loaded behind the trailer tandems actually weighs. At the same time, you'll be taking weight off the drive axles. If unsure of the exact location of the center of gravity of your cargo, where would you rather have the center of gravity located if you couldn't get it centered? If unsure of the exact location of the center of gravity of your cargo, you'd rather have the load a little closer to the front than to the rear. You can slide the trailer tandems forward as far as you would like to compensate for too much weight on the nose of the trailer, but the kingpin to trailer tandem length limitations will prevent you from going too far back with your trailer tandems. A lot of times you'll be loading mixed cargo which will make it quite difficult to determine the exact center of gravity of the load. So when you're making your best guess, try to make sure it's a little forward of the center point between the drive axles and trailer tandems. That will give you the best chance of being able to adjust the trailer tandems so that the load will be legal. Where in the trailer could you place cargo so that the weight applied to the trailer tandems is greater than the weight of the cargo itself?